The silence has been broken in Syria. 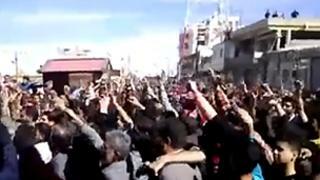 A "day of rage" has now been held in several cities - Damascus, Homs, Banyas, and Deraa, south of Damascus. In Syria, it is not the Facebook generation that is taking to the streets. It is people who are tired of poverty and repression. The demonstrations in Deraa - where the police have reacted most brutally - started on Friday. Several families had gathered to demand the release of 15 school children who - influenced by the protests in Tunisia and Egypt - wrote the popular revolution slogan on the wall: "The people want the fall of the regime". Residents say the children's arrests in the tribal region deepened feelings of repression and helped fuel the protests in Deraa. Security forces opened fire on the protesters on Friday, killing three people. A fourth died from his wounds on Saturday, rights groups say. One YouTube video from Friday shows protesters chanting "Freedom, no fear after today". In another, people are carrying the bloodied body of Amer al-Jawabra, one of those killed. Before long, gunshots are heard, and the men are forced to run for cover. Today, the police have used tear gas against thousands who were attending the funeral of two of the victims. Now, the slogans appear to be harsher. The mourners called for "revolution" - the boldest challenge to Syria's rulers since uprisings began sweeping the Arab world. "Revolution, revolution. Rise up Hauran," chanted the mourners in Deraa, administrative capital of the strategic Hauran plateau, as they marched behind simple wood coffins of Wissam Ayyash and Mahmoud al-Jawabra. "God, Syria, freedom. Whoever kills his own people is a traitor," they were quoted as saying by Reuters news agency. Eyewitnesses told the BBC that residents of Deraa were expecting more trouble in the coming days and hours. The communication lines appear to be down, and the security presence is high. Analyst and writer Louai al-Hussein said that the inevitable had happened. "Syria is now on the map of countries in the region with an uprising," he said. The al-Watan newspaper, which is close to the regime, says the authorities have decided to open a high-level investigation into the killings on Friday. They have also pledged to respond to people's demands in Deraa that the arrested school children be freed. The government has announced several measures to improve the situation in Syria in the wake of the popular uprisings in Tunisia and Egypt that toppled the presidents of those countries. President Bashar al-Assad told the Wall Street Journal in January that Syria's leadership was "very closely linked to the beliefs of the people" and there was no mass discontent. Many in Syria say the hope was for the government to introduce real change, especially to improve their job prospects and living standards. Syria suffers similar problems to Egypt and Tunisia - poverty is high and the country has been under one-party rule for almost 50 years. But the margin of freedom is smaller in Syria. Syria has been under emergency law since 1963, and political freedoms are almost entirely absent. On Wednesday, the police arrested around 36 protesters who went to interior ministry calling for the release of political prisoners. Thirty-three of them, including women, were charged with weakening national morale and compromising the state. They are reported to have started a hunger strike, and Hirvin Orso, who stopped drinking water, is said to be in a critical condition. How things go now will depend on the government's response, says writer Louai al-Hussein. "They will either oppress it, and it will get worse, or [they can] allow peaceful demonstrations in Syria," he says.